From this we can see which elements can be combined in certain sectors of the home, in order to achieve a complete balance and attract a positive chi. Thus, we will put a symbol of water in the shape of a fountain, aquarium, and pictures with water motives in the northern sector, which will represent the field of care, but we will strengthen this sector by adding a metal element, which can be a metal bowl or some other metal object that will symbolically stimulates the formation of water. Also, in the earth sector we will add the element of fire and in the southwestern part next to crystals and earthen jar; we put a lamp or candles. We will strengthen the wood sector by adding water element and so on. By understanding the reductive cycle of the elements we can conclude that by adding water to the wood sector we will reinforce the wood sector because the water feeds the wood, however, by adding wood to the water sector we take away the energy of water, because the tree diminishes water, so we will always use the productive cycle of the elements to strengthen the elements, the previous element that keeps the next one in a circular cycle. 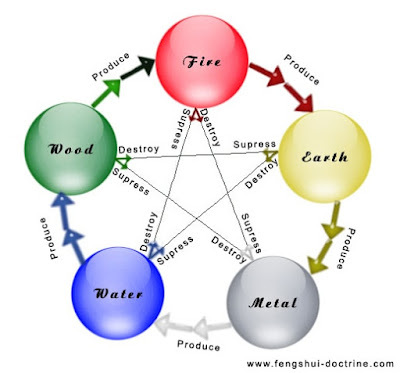 Knowing this cycle is very important in feng shui, so that we know how to destroy an unwanted element that does not suit us and we have no other way to get rid of it, then we do it by adding a destructive element, which must be strong enough or stronger than the one we want eliminate.